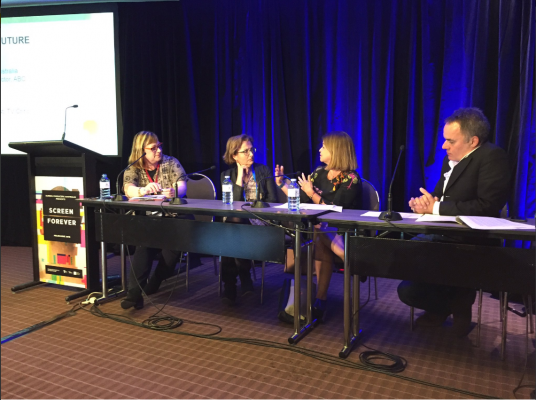 The ACTF sponsored the Children’s of the Future session at the Screen Producers Australia Screen Forever conference in Melbourne last week. The session was moderated by Debi Enker, journalist, columnist and TV critic for Fairfax Media and ABC Radio. The panellists were Graeme Mason, CEO, Screen Australia, Michelle Guthrie, Managing Director, ABC and Jenny Buckland, CEO ACTF. In the absence of any representation from the commercial sector, the panel conversation was nevertheless wide ranging, covering what Jenny described as “a perfect storm of issues”. Everyone agreed that a rich legacy of children’s drama has been built over many years as a result of the Children’s Drama quota, requiring each of the commercial broadcasters to screen minimum levels of children’s drama. But those quotas are now looking vulnerable, with commercial broadcasters often paying licence fees for content which are less than they paid 25 years ago, and children’s content therefore being dependent on foreign investment, which makes many programs that qualify as children’s drama less distinctively Australian than most adult drama. At the same time, the viewing habits of children are changing, with children watching much less free-to-air television than they used to. Two themes therefore emerged – how should children’s television be financed and supported in future; and how do we keep up with the audience as they continue to watch content on devices other than television? Michelle Guthrie pointed out that “the core thing is that audience behaviour is fundamentally changing” and said that this means that the way the ABC delivers content has to be fundamentally different. In particular, she said that the audience is no longer tied to appointment viewing and is increasingly going online. The ABC is responding with the iView app, its ABC For Kids and ABCME apps and websites which, Michelle said, were “going crazy”. Graeme said that the idea of the ABC taking on the entire responsibility for children’s programs has been countenanced before, and that the commercial broadcasters might be willing to contribute to a fund to enable them to do that. But he warned that it would mean fewer outlets to approach for ideas, and Jenny pointed out that competition was desirable as a driver of quality. Jenny also noted that the ABC currently has no quota requirements itself and that any special funding for children’s content needed to be adequately quarantined and protected for the children’s audience. These are important issues that need to be explored and clearly the challenge for the production industry will be to arrive at a shared view on how it would like to proceed when the Australian Content Standard comes up for review soon. The stakes are obviously very high.